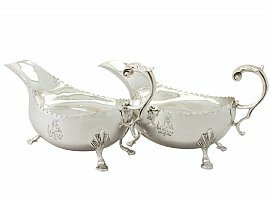 These fine vintage Elizabeth II sterling silver sauceboats have a plain oval rounded form, in the George III style. The body of each piece is plain and embellished to one side with a bright cut engraved crest of a unicorn rising out of a coronet. Each sauceboat is ornamented with a scalloped border to the shaped rim. These vintage silver sauce boats are each fitted with a C scroll handle featuring a chased leaf decorated thumbpiece and bifurcating scrolling lower terminal. Each of these fine examples of Irish silverware is supported by three impressive applied hoof feet with stylised shell decorated sockets. These vintage silver sauce boats are a very good gauge of silver, fine quality and in excellent presentation condition. The bright cut engraved crest to each piece is very crisp. Length from back of handle to tip of lip 17.5cm/6.9"